You’ve been decking the halls and fighting the crowds, plus the garland you shoved in the back of the crawl space last January is still missing. The wrapping paper is gone, and the kids are bonking each other with the empty tubes. You need a laugh, and you need it now. I’ve got you covered with these printable Christmas gift tags that say what you really want to. Snark. It’s what’s for Christmas. 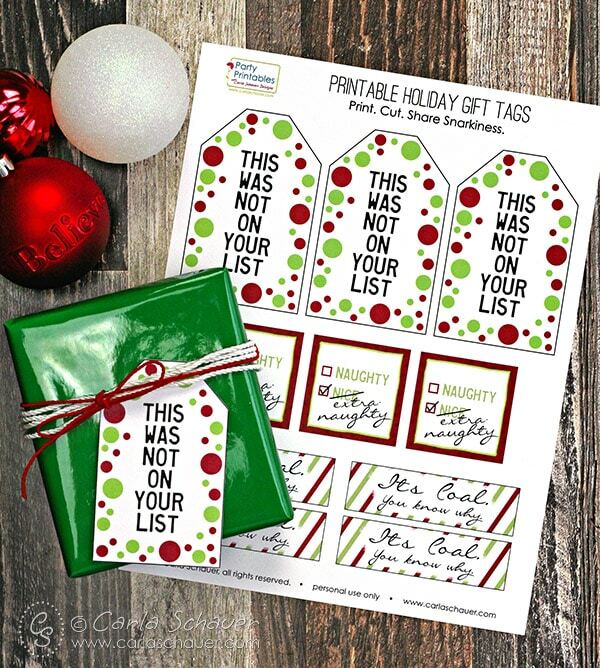 Free Printable Snarky Christmas Gift Tags |Carla Schauer Designs. This set of silly printable Christmas gift tags is my holiday gift to you, my snark‐loving friends. Use them for your siblings, kids, crazy best friend, and anyone else who could use some Christmas Ho‐Ho‐Hos. How’s that for a happy holiday? Sarcasm, snark, silliness, (honesty? )…whatever you call it, embrace the humor this holiday season. These tags, plus a few glasses of eggnog should make you forget for a moment you still have 3 gifts yet to buy. Download to your computer and print at home. I like to use mid to heavy weight white cardstock. The snark is free, and so are the printable gift tags! Want more snark in your holidays? If more sarcasm means more happiness in your house (as it does in ours), the full set of snarky holiday gift tags is listed in my Etsy shop. A very snarky Christmas can be had by all! Need more holiday crafting? Find all my Christmas Craft Ideas here.